Our client wanted a means of producing energy for their home that was clean, environmentally friendly, passive, easy, and could add value to their house. The real challenge would be the system design, orientation and location of this house. A steep 65-degree pitched A-frame style roof with a T-shaped plan, as well as tall trees on the neighbour’s property meant that access and positioning were going to be the challenges. The family of five were frequently at home during the day, and requiring electricity. After discussing various aspect of the daily load profile with the client we together decided that a 5kW system would be ideal for a long-term solution. Timing had become urgent for this job as The Tasmanian government announced that it would reduce the feed in Tariff from 1:1 to 8c for systems not signed up prior to 1st September 2013. We looked at options of building a ground mounted system however the only appropriate location was not aesthetically pleasing, therefore the best solution was the steep roof faces with the NE and NW aspects. This would also lend well for the long-term when the feed in tariff reduces. The design balances power generation out over the day and provides more energy in winter due to the steep angle therefore maximising self-consumption. 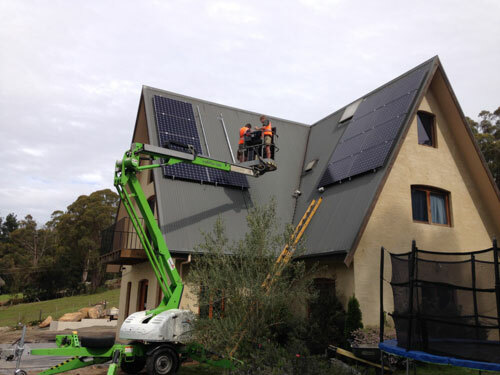 Our client was looking for a high quality, architecturally pleasing system, and the SunPower modules were chosen for their long term efficiency, stylish mat black look and because more power could be installed in the same area as conventional panels. Due to the steep pitch of the roof, the panels were installed using a cherry picker, and timed with landscaping to not impact the garden. We estimated that the system would produce about 7635 kWh per year. After assessing our client’s power bills, a clear benefit can be seen. From October to January 2013 light and power tariff used 750kWh, and the bill was $467, October to January 2014 light and power tariff used 375kWh and exported 844kWh back to the grid, the bill was $149. Note: System was commissioned on the 11th October 2013, half way through the billing cycle. The January to April 2014 bill was $151 in credit!